Chilliwack – Kim Gemmell is a Chilliwack author and Optimist. 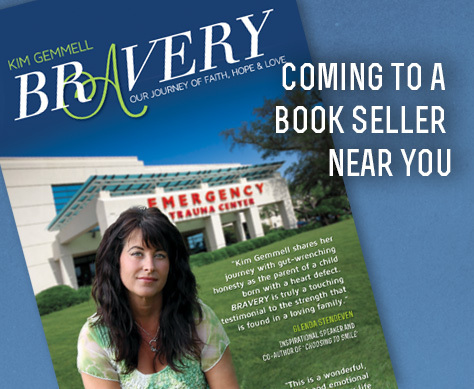 Her book “Bravery” was released in 2013 and has become required reading for many who are looking for a positive way to see the world. Kim had a scare many years ago when her son was born with medical difficulties. He is now a healthy and typically rambunctious teenager. She now has an on line blog and FVN is proud to be part of the network in sharing her words of wisdom. There are many quotes I find inspirational, but I would have to say this one is my favorite. Maybe it’s because I, myself, fell so many times……I think most of us do throughout our lifetime. Today, when I look at that quote, the reason I am most proud and feel accomplished of my life, besides raising my children, is that I kept getting up. Oh, there were times I wanted to crawl in a bunker…. a cold, dark bunker. Sometimes I didn’t want to get back up and am not too sure how I did. Was it a determination that I was born with? Was it genetic? My dad was a professional boxer and he always kept getting back up. It wasn’t until years later that I figured it out. I kept getting back up because I could. It’s a choice. It’s always a choice. We can wallow in our defeats or we can say with conviction, “Tomorrow is another day, and it’s a brand new one.” It sounds simple, and it is. We often make things out way more complicated and difficult than need be! Not only would I get back up but I chose to learn and grow as a result, making that fall worth it. Always, always, always look at the alternatives to every situation. For example, I was watching the Children’s Hospital Miracle Telethon one day many years ago. This one interview struck me like a lightning bolt, and changed my perspective on life! A young couple had recently lost their four-year-old little boy to cancer. I felt beyond devastated for them, and the tears were streaming down my face. I think, on a much smaller scale, I could relate to them. Not long before that, I almost lost my baby on many occasions when he was battling his critical heart defect. As I was watching this story and becoming more and more grief stricken for this poor couple, things began to change once the interview started with the parents. My entire feelings shifted and it was almost as though something magical happened. They began sharing their pain of losing their baby and how everything would be changed forever, but how they felt blessed. They shared special stories of fun times and talked about how lucky they were. At first, I thought I heard them wrong. How could they feel blessed and lucky??? They must be heavily medicated or something. But then they explained why they felt blessed and how those four wonderful years spent with their little miracle were the best. Four years of pure joy with him. At one point, my body became numb and my heart started to race as I began to relive the memories when Avery was only about a month old. This was a time when my dad had just died from a sudden heart attack, and Avery’s little body was beginning to shut down, too. I remembered praying for Avery, “If only I could bring him home, even if only for a year. If all I could get was one year, I would be the happiest mom……. Just one year to take him home to snuggle, cuddle, laugh and play.” I then clearly understood what they meant. During their story, they said, of course, there were many times they wanted to disappear into nothingness, but that was the alternative they decided NOT to take. You see…. it is a choice. Instead, they chose to keep their son’s memory alive and rejoice in all the wonderful memories they had in those short four years. What happened couldn’t be changed or ever forgotten, and their only control was their ‘take away’ from it all. Their attitude, and if they ‘got back up,’ would determine whether they would have a bright future or not. Since that day, my outlook on life considerably changed and I began to decide my path by looking at the alternatives. When my dad died at 59, everyone said things like, “Oh, he was far too young…life isn’t fair sometimes.” I didn’t see it that way at all. Of course, I wished I had more time with my dad. After 19 years, I still miss him every single day. But I don’t feel ripped off. Instead, I felt blessed to have had the best father ever. He was there for all my milestones growing up….graduation, walking me down the aisle at my wedding, and the birth of my first baby. They just didn’t get it. They were feeling sorry for me and I was feeling blessed. But that was okay because it inspired me to change my life’s journey and help others understand how life can be wonderful, even if it doesn’t go as we expected or planned. Whatever brings you to my blog, and whatever you have gone through or may be going through, take a bit of time and think of the alternatives. There is always a choice. When we choose to be positive, more positivity surrounds us. Look at any positive people you know and look at who surrounds them. I bet it’s more positive people. You can contact Kim Gemmell at kim@kimgemmell.com or phone 604 819 5299. Be the first to comment on "BLOG – Chilliwack Author Kim Gemmell – Lots To Be Thankful For, Even When We Don’t Think So"